Looking for some good clean superhero fun? Then give the Power Pack digests a try! If you’re not familiar with Power Pack, they are a team of super-powered siblings ranging in age from 5 to 12. They first appeared in 1984, but Marvel started a new series of adventures five years ago featuring Power Pack in their “All Ages” range of books. 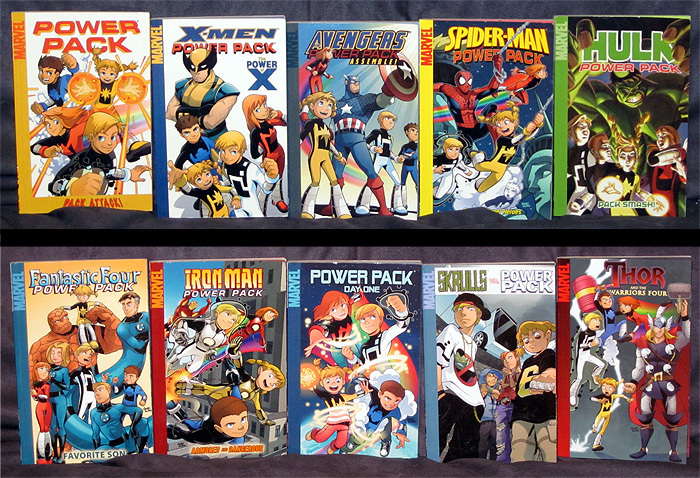 There have been eleven Power Pack mini-series in the “All Ages” range, each reprinted in digest format. These Power Pack stories are pure and simple fun! You can’t help but love these kids! Alex the brave big brother; Julie the book smart older sister; Jack the smart alec younger brother; and Katie the impulsive baby of the group. The kids come across as genuine and endearing, rather than grating on your nerves like some child characters. The label “All Ages” really applies here. Kids from age 6 through 100 can enjoy these books. Several years ago I started reading these digests to my step-son before he could read himself. I’d often find him pouring over these digests looking at the pictures trying to relive the adventures. Now he’s 11 years old and enjoys reading the digests himself. Whenever a new one comes out, he ravenously rips through it. Heck, I enjoy reading these digests! Each digest is a stand alone story. You don’t have to buy all the previous books to understand what’s going on. Most digests guest-star a popular Marvel character or team. Often the story is timed to coincide with the release of a related film (i.e. the Power Pack/Thor digest just came out and the Thor film is on the horizon). The coordination with the films provides a nice link for kids. For younger children that may not be old enough to see the Marvel films, these digests at least expose them to the characters. They see all the merchandise on TV and in the stores, so they’re naturally curious about the heroes. For the older kids that can see the Marvel films, these digests serve as a primer so they know the basics of the characters. For grown-ups, these digests are fun adventures with some favorite characters, but without the angst or event fatigue. The majority of these digests have been written by either Marc Sumerak or Fred Van Lente, and drawn by Gurihiru. Sumerak and Van Lente both do an excellent job conveying the innocence, exuberance, and sheer sense of fun these characters possess. Gurihiru’s art has hints of Manga styling, but the crisp lines and vibrant colors make these books work. If you have children ages 6-13, I urge you to pick up these digests. You can order them from your local comic shop. Your children will love them, it will get them reading, and they’ll discover the wonder of superhero comic books. To be fair, I’ll admit that I’m biased. 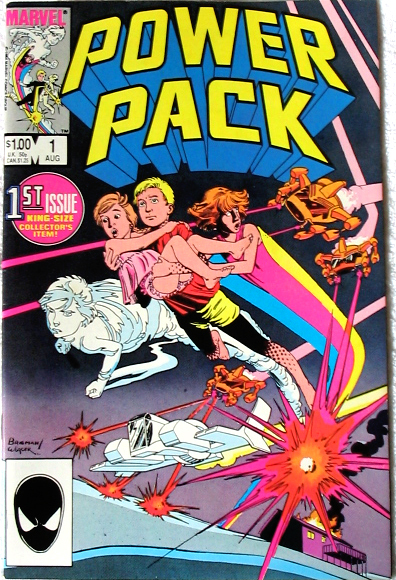 I bought Power Pack #1 off the shelf back in 1984 and collected it for years. I enjoyed the adventures of these children when I was 11 years old. 25 years later and my own 11 year old is thrilling to their adventures. That makes this old geek happy. Exellent recommendation, Shag. These were very popular with my son when he was about 5 and 6. We especially enjoyed the Spider-Man digest.